​​​"HEITZMAN SIONS" --- THE PREMIERE HOME OF THE FINEST LONG DISTANCE RACING PIGEONS IN THE WORLD--WHERE HEITZMAN'S DREAMS ARE CHERISHED AND MAINTAINED! THE TRUE HOME OF HEITZMAN' FINEST SIONS-- FLYING YOUNG BIRD 500 MILES CONTINUES TO AS OUR LIFE'S DEVOTION! IN 2017, THE NO SWEAT HEITZMAN SIONS WON MULTIPLE DISTANCE RACES ACROSS AMERICA--- BUT WE WERE MOST PROUD OF 2 RETURNS FROM 1,000 MILES! OUR 2018 BREEDING PROGRAM WILL BE THE STRONGEST EVER, MOST OF THE YBS WILL OWN GRANDPARENTS OF WHICH ALL FLEW 600 MILES OR FARTHER! ​The NO SWEAT HEITZMAN SION COLONY in 2018 is comprised of FIVE lofts and a dozen individual breeding pens as well as a feed room, etc. The 2018 Breeding Season consists of 60 pair of HEITZMAN SIONS. ONLY HEITZMAN SIONS are kept. And the majority of these HEITZMAN SIONS are Sions which originated from his earliest imports directly from Paul Sion in France. Earl Lowell "Robbie" / "No Sweat" Robbins, Jr. was Charles Heitzman's closest friend, often living in Mr. Heitzman's home and helping Mr. Heitzman maintain his own lofts in Jeffersontown, Kentucky during his later years in life. 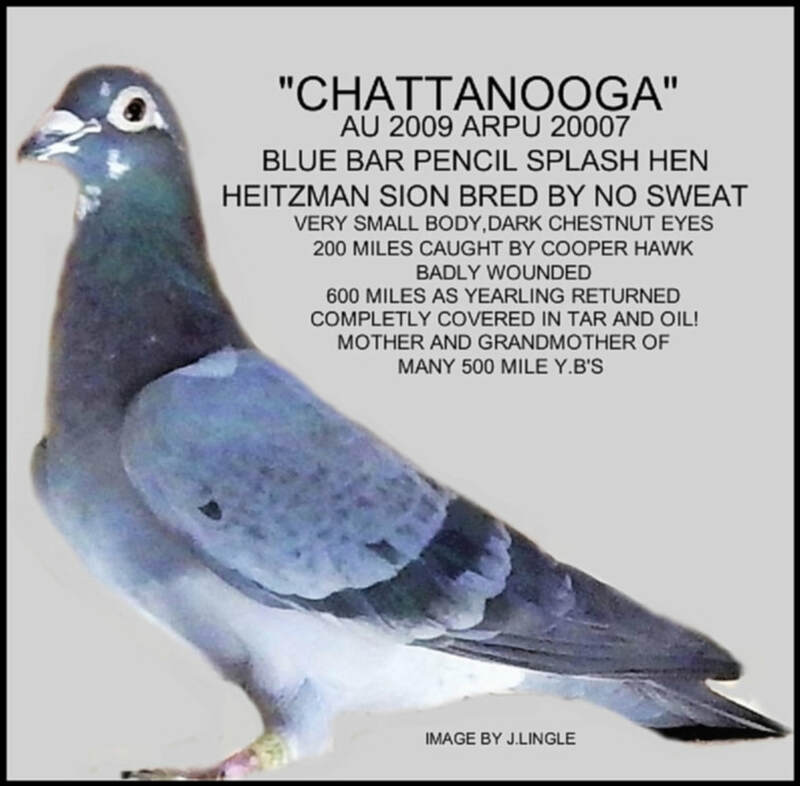 In 2017, the acclaimed Kentucky author who writes under the name "NO SWEAT" finished an 80 page story on Charles Heitzman which appeared in America's top racing pigeon magazine, THE RACING PIGEON DIGEST. That copyrighted article can now be read on this website. Nowhere else in the world are there such Sions devoted to the original Paul Sions and which are currently setting records at long distances. Not yesteryear--but TODAY! The NO SWEAT LOFTS take great pride in having had 77 young birds which have flown 500 miles over the past 15 years. And in 2017, 4 birds were released from Key West, Florida and 2 of the 4 did in fact return from the 1,000 MILE toss. 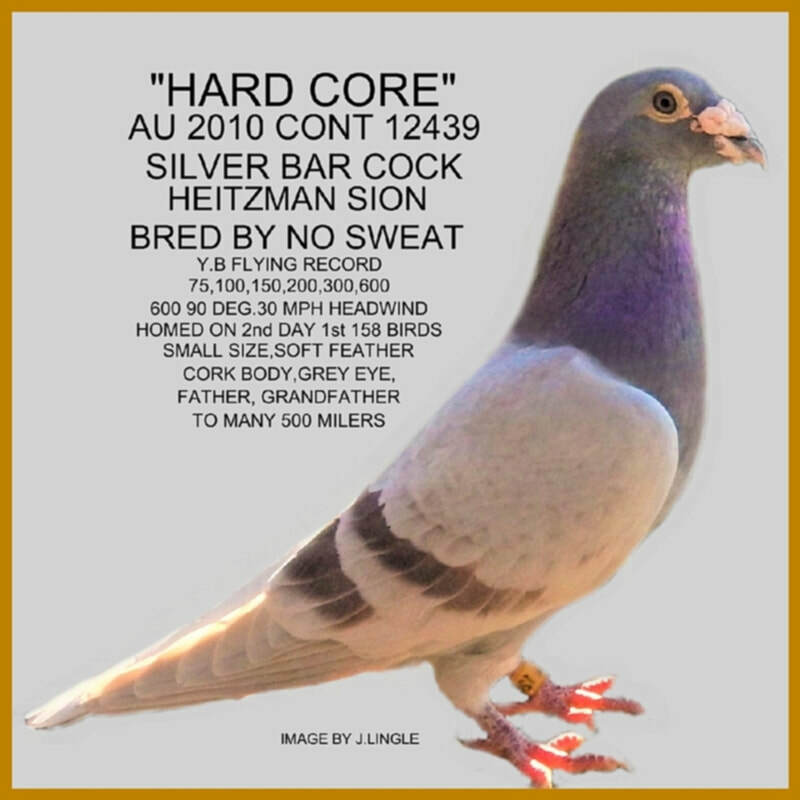 THE NO SWEAT HEITZMAN SION LOFTS are devoted to maintaining the finest long distance racing pigeons in the world. As Charles Heitzman noted, KENTUCKY not only has the finest race horses in the world but also, the finest racing pigeons. Of all the different strains of racing pigeons which Charles Heitzman had, Sions were by far his greatest. In no other strain did he find such a combination of beauty and performance. The Sions have long been noted for their ability to stay in the sky and on the wing when other birds become tired and go down. ​HAVING won OVER 800 FIRST places with racing pigeons in his life, including NATIONAL TITLES, ROBBIE ROBBINS / "NO SWEAT" needs no introduction to the sort. Racing pigeons bred by him have set many records across the United States over the past half century. He has penned hundreds of articles involving racing pigeons which have been published all over the world. Today, he is totally devoted to extreme long distance flying and breeding the finest racing pigeons on earth. Quality comes first. 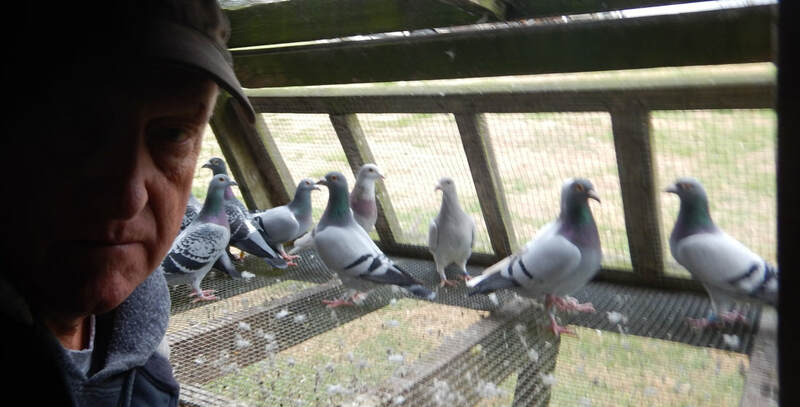 As you can see in just this one photo taken in January, 2018, this being but of some of his 125 breeders, the quality radiates in each pigeon. "When someone puts their eyes and hands down on a NO SWEAT HEITZMAN SION, they know in their heart they are being rewarded. Many strains come and go but the original Paul Sions have now lasted 100 years. In no other lofts in the world can there be found a more pure colony of the original SIONS. ​IN this photograph you see Mr. EARL LOWELL 'ROBBIE" / "NO SWEAT" ROBBINS, Jr. , January, 2018, inside one of the five main lofts which compose the NO SWEAT HEITZMAN SION colony. "Robbie" or as his closest friends call him, "NO SWEAT" is the author of four books; THESE PRECIOUS DAYS, NEFARIOUS, SINGER ISLAND & ERNEST HEMINGWAY and LETTERS FROM A GENIUS TO AN OAF. In 2018, No Sweat hopes to see at least two more of his novels find publishers. In January, 2018, he is concentrating on a lengthy article for THE RACING PIGEON DIGEST involving his experiences with extreme long distance flying. Besides being the world's prominent SION breeder, No Sweat spends much of his time writing and continues to hope he will see a dozen books by him before his death. At present, he still works for Eastern Kentucky University where he received his MASTERS degree and where he swam long distance for four years with 18 ALL AMERICANS on one of the best swim teams in the nation. During the summers, No Sweat spends his time scuba diving with his wife and two grandsons on Singer Island. And later in the year, lobster hunting in the Florida Keys. In September, 2017, he had just left Big Pine Key when Hurricane IRMA hit and totally demolished the home he had been living in for the past seven weeks. No Sweat has earned fame as an archeologist having dug in many sites across the south eastern areas of the USA. He located 17 ARAWAK burials in a tidal cave in Eleuthera, recovered 600 Civil War muskets from the Yucatán, excavated 19 burials at 23 feet deep in a cave in eastern Kentucky and has dug--possibly-- more American Civil War relics than anyone else ever. He is also an avid KENTUCKY AGATE hunter and has dug agates which have wound up in several museums as well as The Smithsonian. He loves being with his family and especially when they are outdoors exploring caves and snake hunting.